Let's say you find yourself with just three children on a Saturday night and you think it'd be nice to do something a little bit special and fun. You ask those lovely three if they'd like to have a "dinner and a movie date night". And they say yes, because this is a special treat ... first, because dinner out is a no-no for the family budget and second, because said family doesn't own a DVD player and must purchase one to have movie night. You decide on Olive Garden for dinner. Can't go wrong there, all you can eat breadsticks, salad, and pasta is perfect date night fare. Then you must buy the DVD player. Again, not a problem - Target sells them very inexpensively so you buy the cheapest one they have (which bends, but doesn't break, the family budget). 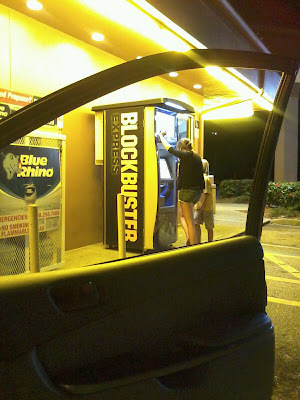 Let the children pick out a movie at the Blockbuster kiosk. I suggest that they not leave the car door open, especially if the mosquitos are rampant. Head home, get settled in for the movie. Before planning movie night be sure that your television isn't too old to hook a DVD player to. If it has celebrated it's 20th birthday it's likely too old and you won't be able to watch your movie. Before assuring children that you'll get a RF Modulator (fancy term for "thing that adapts really old tv to be able to hook up to a dvd player") so you could watch the movie the next day know how much it costs. Three stores later only to discover it's $30 and over the budget, and you won't be able to watch your movie. Before then promising lovely children (six now, the rest are home) that you'd hook DVD player up to a different tv and movie night would begin, a day late, after chores were done make sure DVD player works. I do believe buying the least expensive DVD player may not be the best route to go if you want one that will actually play a movie. If you don't buy a half decent DVD player you won't be able to watch your movie. At this point throw in the towel and return the movie. Oh, but wait, before doing so find out when the movie must be returned so you don't return it 7 minutes late and have to pay for two nights of movie rental for a movie you've never seen. That's right, you won't be able to watch your movie, but you'll pay to rent it for two nights. It is now best to realize the obvious. You've survived 3 years without a DVD player and you'll survive a few more, because attempting to watch a movie was far more trouble than it was worth. Snuggle up under a quilt and watch whatever you've got TIVO'd while eating popcorn with the kids and call it a weekend. Oh no! I love that story. True slice of life! You should have been able to play the movie on your computer... small screen but better than no movie at all.